Celeb Gossip News – Pompeo Questions the Value of International Groups Like U.N. and E.U. The speech, delivered in a palatial concert hall in Brussels, was intended to explain Mr. Trump’s worldview to a deeply skeptical audience, including many Europeans who see Mr. Trump as undermining international agreements that have kept the peace in Europe and enhanced prosperity. Mr. Pompeo called Britain’s decision to leave the European Union a “political wake-up call” for the bloc, which is based in Brussels. 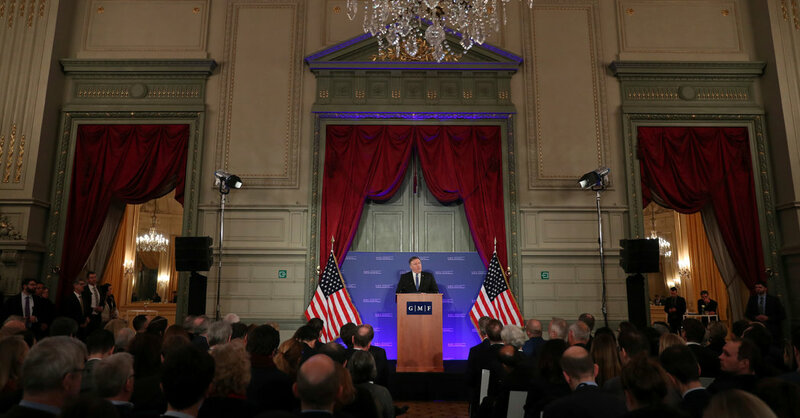 He then asked whether the European Union “is ensuring that the interests of countries and their citizens are placed before those of bureaucrats here in Brussels?” Someone in the audience shouted an unequivocal, “Yes,” a response Mr. Pompeo ignored. The World Bank, International Monetary Fund and World Trade Organization also came in for sharp criticism. “International bodies must help facilitate cooperation that bolsters the security and values of the free world, or they must be reformed or eliminated,” he said. After the short speech, Mr. Pompeo took no questions. Responses ranged from tepid to hostile. In addition to Mr. Trump’s regular criticism of NATO, the United States and the European Union are fiercely at odds over the Iran nuclear deal, which Mr. Trump has pulled out of. Washington has restored harsh sanctions on Tehran, while America’s main European allies are doing their best to preserve the deal and find ways to go around U.S. sanctions. Washington and Brussels are also engaged in sometimes vicious negotiations about trade as well as American sanctions on European steel on the grounds of “national security,’’ whereas the Europeans do not see themselves as a national security threat to the United States. The Trump administration is also threatening new tariffs on imported cars, all in an effort to reduce the American trade deficit with the European Union. And Washington has sharply criticized Germany for supporting the Nordstream II, a gas pipeline from Russia to Germany that is now under construction. Mr. Pompeo’s challenge to the European Union was a surprisingly undiplomatic comment from America’s chief diplomat, making some European officials wonder what the American response would be if a European foreign minister or the bloc’s chief diplomat, Federica Mogherini, criticized the fissures in the United States in a public speech in Washington. Some listeners were less sanguine, like David Fouquet, a professor at the Free University of Brussels. A Spanish representative to the European Union described the speech as “a very compelling case on the current administration’s plans for a more national oriented” set of policies — while diplomatically avoiding saying what he thought of those policies. Mr. Pompeo’s audience listened for clues about the future of the Intermediate-Range Nuclear Forces Treaty, known as the I.N.F. treaty, which the Trump administration has threatened to jettison despite European opposition. For years, American officials have maintained that Russia was violating the treaty, which banned land-based missiles of certain ranges. Mr. Pompeo said there were some international institutions that “work in American interests and yours, in service of our shared values.” But he listed only three such bodies: NATO, the Proliferation Security Initiative and the Society for Worldwide Interbank Financial Telecommunication, a bank messaging service that is widely known as Swift. John R. Bolton, the national security adviser, threatened to penalize Swift, which gives financial institutions a secure way to wire money around the world, if it did not remove Iran’s banks, including its central bank, from the system. Despite opposition from the European Union, Swift acceded to American demands and thus passed muster with Mr. Pompeo. “This is an excellent example of an international institution acting responsibly,” Mr. Pompeo said. Although NATO also received praise from Mr. Pompeo, he repeated Mr. Trump’s frequent complaint that the other 27 nations in the alliance need to spend more on defense. He then announced that he would host other foreign ministers for a meeting in Washington in April to celebrate the alliance’s 70th anniversary. It would be the first time that a major NATO birthday was celebrated without heads of state. .
NATO officials said that there may be another summit meeting of leaders later in the year that could be portrayed as being timed for the anniversary.